We invite you to apply to our nomadic residency and exhibition programme taking place in London with our partners Green Rooms and Arebyte Gallery. During this 10-day residency in the heart of London, we will transform, make, and exhibit our work in various locations and present the results at Arebyte Gallery in the heart of London’s art district. This full-immersive journey investigates practical approaches to the theme of the mysteries and the hidden, including questions like: What part of an experience crafted through art, research, or everyday language needs to remain untold? What quality of experience exists in a space shaped by the consequences of what must remain hidden? Through a range of practical labs, perception strategies and subconscious expeditions with dreams, intuition, and synchronicity, our peer-to-peer methodology will bring forth effective inspiration and create unexpected new developments for your art or research project. Throughout the residency, you will stay in a shared room at Green Rooms London, a unique space for artists in a beautiful area of the city (private rooms are available and can be arranged). The residency will culminate in an exhibit at Arebyte Gallery London, an organization known throughout the city and beyond for its creativity and collaborative approach. The BecomeBecome open call is an invitation to break the boundaries of how change is created in society. Using the theme of “The Mysteries, The Hidden”, we transform how art is made and exhibited and how research is developed beyond the walls of Academia. Our programmes are collaborative experiences that leave the maker and the viewer of art and research transformed through each step of the process. As participants develop their projects in a space that allows for a radical paradigm-shift, artists get to exhibit their work, and researchers find groundbreaking feedback for their ideas. Previous Becomebecome events have included partners such as Cairotronica in Cairo, Pixelache in Helsinki, and the Anna Lindh Foundation. Arts organizations and academic institutions in countries as diverse as China, Greece, England and Spain have joined our efforts to transform the way we develop transdisciplinary art and science projects. Becomebecome nomadic residences trigger a compelling exchange about the potential to create transformation in society by blurring the lines between the making and the sharing of art and science. As individuals and organizations collaborate, they frequently develop bonds that allow them to create innovative follow-up projects after the original event has finished. Artists, curators, researchers and social entrepreneurs from all backgrounds are invited to the open call. The diversity of participants in previous events has created fresh outlooks and exceptional work, and we intend to build on these unique synergies during our London event. 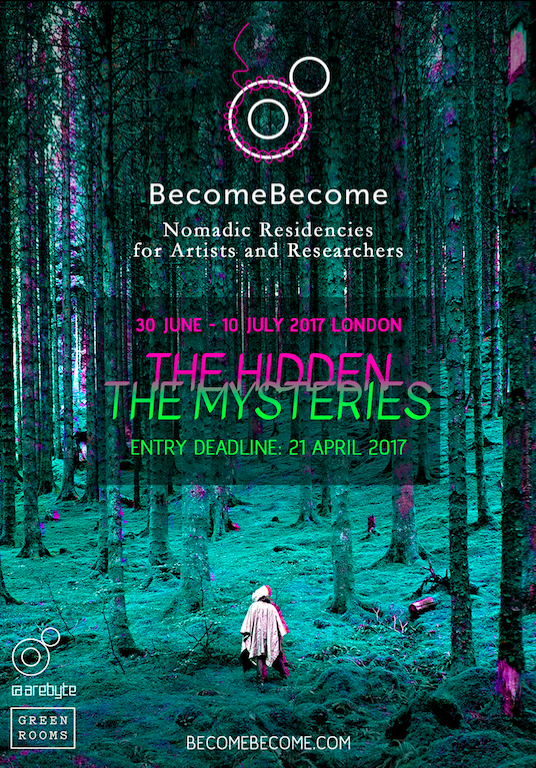 BecomeBecome is a non-profit network of individuals and social actors that host nomadic residencies across Europe and beyond. Our strategy is to keep costs to a minimum while sharing the resources of partners. We keep our open call free of charge and participants contribute a fee only once they have been admitted to ensure that the basic expenses can be covered. ROLLING ADMISSION LIMITED TO 12 PARTICIPANTS.